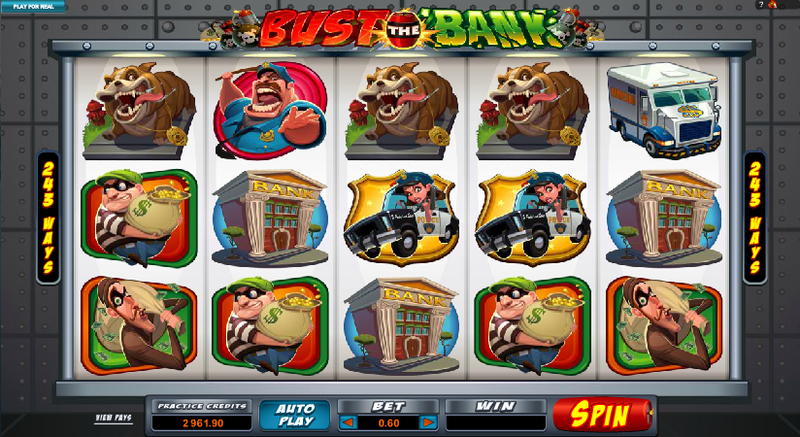 We’ve seen a few heist-based online slot machines in our time and Bust The Bank from Microgaming is certainly another example of how, if done correctly, it can be a winner. This slot combines all the elements necessary to make an addictive slot and a big part of that is the numerous bonus features. There are no playing cards symbols here and the game uses a whole range of robbery-related pictures to bring the action to life. We have a police dog, an explosive alarm clock, a security van, a bank, a policewoman in a car, a truncheon-wielding copper and two thieves legging it with sacks of swag. The scatter symbol is a bomb and there are also two bonus symbols – a green safe and a piggy bank while the wild is Bust The Bank logo. There are five reels and 243 ways to win which means that as long as matching symbols are in adjacent reels, it’s a winning combination. The green safe is a minor bonus but all you need to do is land it on reels one or five; if you do so the safe door will open up and coins will pour out. If there are symbols below the safe’s position then you will receive a similar award for each one. Landing the piggy bank anywhere on reel three will win you this award and when you do you’ll be prompted to smash the big pig which appears in the middle of the reels to reveal a cash prize. Our thieves appear randomly on the reels and run across, awarding a bonus amount. 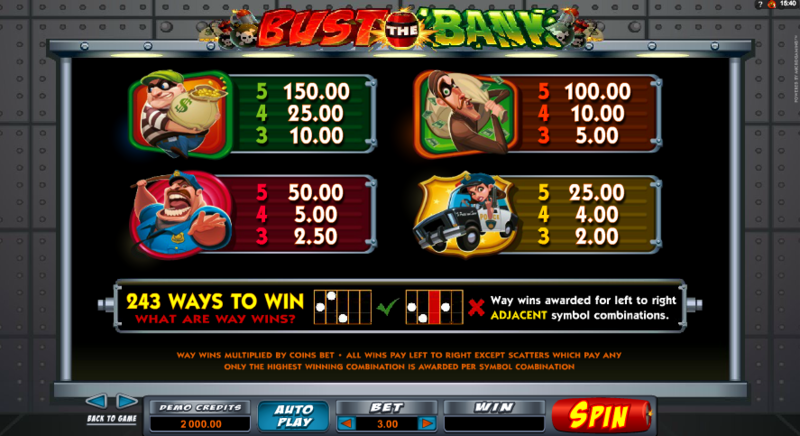 This is the main bonus game and you will trigger it by landing three, four or five bomb scatter symbols anywhere on the reels; you’ll win 8 free spins and during this phase reels one and five are always wild. If you land any scatters while in the bonus round, they are worth one extra spin each. The action packed symbols and the variety of bonus games mean this a game we often return to. Animations on winning combos are creative and amusing and there’s a Pink Panther-esque soundtrack. The paylines are fixed and the minimum wager is £0.60 per spin with a maximum of £6.00.